It started off like any other ballet barre workout: I ran through my checklist of positioning and alignment, like all dancers everywhere, when I started my pliés. Rest hands lightly on the barre. Turn out from the hips. Pull up and press the feet into the floor. And then I laughed at out since I could barely see my feet at all. My baby bump was squarely in the way. At 32 weeks pregnant, first position looked very different. 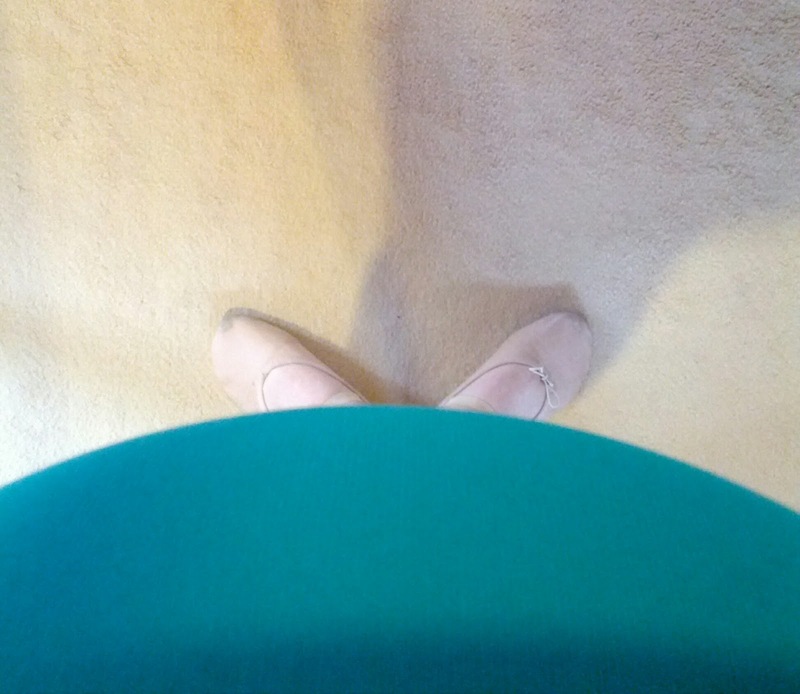 I enjoyed dancing throughout my pregnancy for so many reasons. It was good for my growing and changing body, it was good for my mind and it was wonderful for my soul. It kept me active and helped ease some of the pregnancy discomfort of sore hips, back and feet. It gave me a comforting, familiar activity to do during a very unfamiliar and somewhat anxious time. And it was a great way to connect with my baby. I loved feeling her little feet and hands respond to the music and to my movements. It was a very special pas de deux. Before I go any further, it’s important I give the same disclaimer from my Yoga for Dancers post: I’m not a healthcare professional and though I’ve been dancing for most of my life and have even taught dance, I don’t consider myself an expert. I can only speak to my own personal experience. I talked to my doctor and my midwife about dancing while pregnant, as I would recommend anybody do. You need to do what’s best for you. For me, that meant alternating gentle ballet barre workouts with prenatal yoga, taking lots of walks and meditating. I followed Kathryn Morgan’s Ballet Barre videos with a few modifications as things progressed: no forward port de bras, very small port de bras backwards, extra special attention to hip placement and low extensions. It was really interesting to feel how my body was changing and to figure out how to adjust to those changes. No surprise, the biggest shift I felt was in my balance. I really had to work on engaging all the muscles in my ankles, legs, core and arms to compensate for my bump pulling me out of alignment. I searched and searched for a prenatal dance class in Paris but I just didn’t have any luck, hence why I opted to dance at home. But if you’re in the Edmonton area, check out J’adore Dance for their excellent pre and post-natal dance classes. My sister did Salsa Mama dance class there with both her boys and they now offer a Ballet and Barre Mama class. Most yoga studios offer special prenatal yoga classes. Do some research beforehand and ask around so you can find the right class for you. Additionally, there are tons of prenatal yoga videos on YouTube. Again, be mindful of how you feel and always check in with your doctor/midwife/healthcare providers. Dana Stephensen, Soloist with The Australian Ballet, recently celebrated her son’s first birthday and her return to dancing full-time this season. Check out her excellent blog and Instagram account, The Balance Point(e) for her insights into balancing dance and motherhood, plus tips for healthy eating and general wellness. Principal Dancers Heather Ogden and Guillaume Côté of The National Ballet of Canada are expecting their second child, a sibling for their young daughter Emma, in January 2017. Their announcement on NBC’s Facebook page was beautiful and garnered thousands of ‘Likes’ and comments from well-wishers around the world, including yours truly - The National Ballet even ‘Liked’ my comment back! New York City Ballet Principal Ashley Bouder documented her pregnancy on Instagram with her own hashtag #Bouderbump. There’s a great photo of her, sweaty and beaming post-performance with her fiancé and an 8 week sticker on her belly, having just performed the roles of Odette and Odile in Swan Lake at two months pregnant - like a boss! Her little girl Violet was born the day after my Moira made her grand entrance, also by C-section. It’s cool to know I have a badass C-section scar just like one of the best ballerinas in the world; that definitely bolstered me during my recovery. Though I was never whipping myself around in perfect fouetté turns at six months along like Ashley was in this video, I was always proud and thankful to be dancing while pregnant. It kept me happy, healthy and connected to my Tiny Dancer and I will cherish those memories forever. It also reaffirmed how much I love to dance and how much I looked forward to dancing and sharing that with my girl. And that’s something so special, it needs its own blog post. Watch the blog for Part Two of When 1st Position Looks Different coming soon!